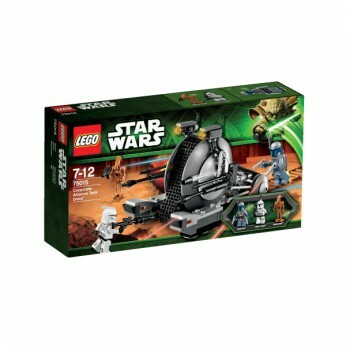 LEGO Star Wars Corporate Alliance Tank Droid features large track tire and 2 flick missiles. Includes 3 minifigures…. Build the great Battle of Geonosis where the Separatist forces are advancing on the Jedi Knights and their clone army with the LEGO Star Wars corporate alliance tank droid! Help the Clone Troopers to repel the Droids crushing track tire and two flick missiles! Then fend off the Battle Droid and infamous bounty hunter Jango Fett. LEGO model number: 75015: Includes a Clone Trooper, Jango Fett, the Battle Droid, 2 blaster pistols, a blaster and a blaster rifle. For ages 7 years and over; EAN: 5702014974838. WARNING(S): Not suitable for children under 3 years old. To be used under the direct supervision of an adult. This toy costs approximately £19.99 (for the latest and best prices make sure you check our retailer list for the LEGO Star Wars Corporate Alliance Tank Droid 75015 above). In our review of LEGO Star Wars Corporate Alliance Tank Droid 75015 we classed it as being suitable for ages 6 years, 7 years, 8 years but recommend you check the manufacturer specific advice before purchasing.